German-headquartered logistics provider Dachser posted 5.5 percent growth in 2018 on record shipment and tonnage figures, driven primarily by its European export business. The company reported increased consolidated net revenue of EUR 5.57 billion (USD 6.58 bn), with shipment numbers lifted 2.5 percent to 83.7 million and tonnage up 3 percent to 41.3 million metric tons. While the global logistics provider’s growth was boosted by economic conditions, it said certain challenges became increasingly apparent: the shortage of professional drivers and logistics operatives; potential capacity bottlenecks resulting from pronounced seasonal peaks and a shortage of load capacity; and growing uncertainty about diesel driving bans, Brexit, and the future of international trade relationships. Dachser’s Road Logistics business field—which comprises the transport and storage of industrial goods (European Logistics) and food (Food Logistics)— increased its consolidated net revenue by 6.6 percent to EUR 4.47 billion. The European Logistics (EL) business line posted the strongest growth with net revenue up 7.0 percent to EUR 3.55 billion. Shipments and tonnage each increased by 3.1 percent. “All four regional business units helped substantially strengthen the network. The network effects in the export business ensure that the EL business units continue to grow and mutually drive each other’s growth,” Simon said. 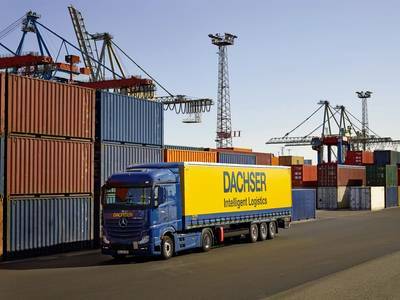 Dachser’s Food Logistics business line also posted robust revenue figures for 2018. Consolidated net revenue increased by 5.3 percent to EUR 917 million. The virtually unchanged number of shipments compared to the previous year was offset by tonnage growth of 2.0 percent. The Air & Sea Logistics business field again proved to be volatile. As a result of exchange-rate effects, decreasing freight rates, and a downturn in volume on the China-Europe route, consolidated net revenue stagnated at around EUR 1.19 billion. A 2.9 percent decrease in the number of shipments was offset by tonnage growth—most notably in sea freight—of 6.6 percent. In 2018, the company invested EUR 126 million in logistics facilities, IT systems, and technical equipment. For 2019, the company has earmarked EUR 234 million for this purpose. Dachser also places a strong focus on training, an approach that has proved very successful, particularly for professional drivers. “At present, we have 207 people training to become professional drivers through Dachser Service & Ausbildungs GmbH, which makes us one of the largest driver training centers in Germany. Our next step is to broaden our focus to include logistics operatives in transit terminals and warehouses,” Simon said. DACHSER SE’s subsidiary, DACHSER USA Air & Sea Logistics Inc.’s revenue increased by 11.9 percent to $221 million in 2018. Along with growing the network, Dachser will continue to invest in new state-of-the-art technology as it finalizes the global roll-out of its transportation management system, which provides its customers with one-stop-shop connectivity and visibility of their entire supply chain. Providing end-to-end visibility is a key element in Dachser’s enhanced customer service strategy. Additionally, Dachser will focus on providing dedicated customer service teams to address the complicated automotive and pharmaceutical sectors, each of which require a sophisticated knowledge of the industry. This program was successfully launched in Mexico and will be expanded into the U.S. in 2019 as part of the overall growth strategy.